The Giant Schnauzer is the largest of the Schnauzer family. They are the epitome of agility, strength and unique looks. Originally bred as cattle herding dogs, Giant Schnauzers require substantial exercise. Their wiry coat requires a lot of maintenance to keep it looking as it should. When correctly groomed the Schnauzer has a very tailored look, with a distinctive rectangular head, arched eyebrows and a full beard. There is nothing soft and fluffy about this breed. Due to the cost and work required to keep the coarse wiry coat by hand-stripping, a lot of pet owners opt to have the coat clipped and the furnishings kept shorter. Clipping this coat will result in a dramatic change in texture and colour. The correct harsh wire coat needs to be encouraged by plucking the blown coat when it is ready to be removed. This stimulates the hair follicles to produce new guard hair. Without stripping, the guard coat will not grow in properly and will lose it’s brilliant colour and texture. If only the undercoat grows, the coat will develop a softer texture and muted colours. If you are planning on clipping the coat, it is recommended to use any blade within the range #4F – #10 for the body. 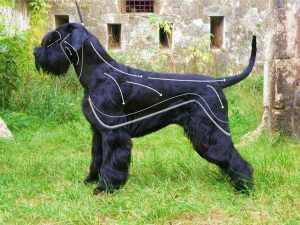 The throat area, under tail and sanitary areas – under tail and tummy – should be clipped using a #10-#7F. If clipping the coat, use a coat rake after clipping, as this can help to promote correct coat growth and colour. For everyday use mild/hypoallergenic shampoos are recommended. This coat would require two different specific shampoos. The furnishings may need volume, detangling or shine, whereas the coat itself must not be softened to maintain it’s correct texture. This coat type doesn’t require any conditioner on the top coat but you may want to use conditioner on the furnishings to condition and detangle.